Last week we went to the panto at the Combe St Nicholas village hall. 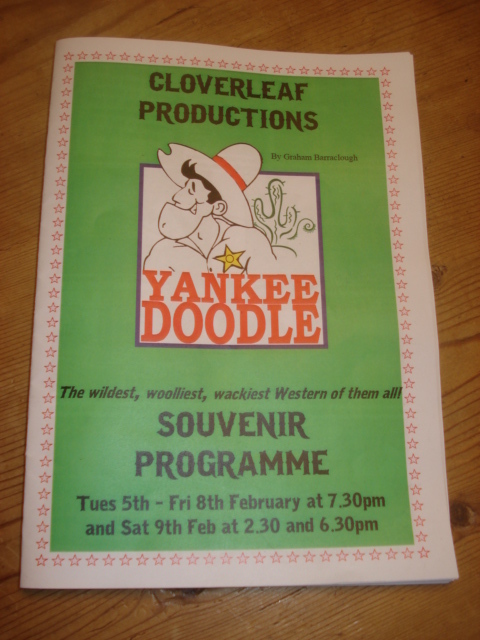 It was “Yankee Doodle”, not the most typical panto you might say but good fun all the same. We had the usual panto dame, who this time was searching for missing gold in the dessert, where she comes upon bandits and ghosts down the mine and various mirages such as a cat and a rabbit. Then they meet a tribe of red indians and somehow it all comes together and there is a happy ending. It’s a bit of madness really. The costumes were really excellent and considering there is not much room on the small village hall stage The Cloverleaf players put on a good production. This is the 4th panto at Combe we have been to since we arrived. It was one of the first things we went to when we moved here. And long may they continue.